How do you make a great garment even better? Make it more comfortable by adding just a touch of stretch. Meet our new line of Stretch Chinos - thoroughly classic, supremely comfortable. 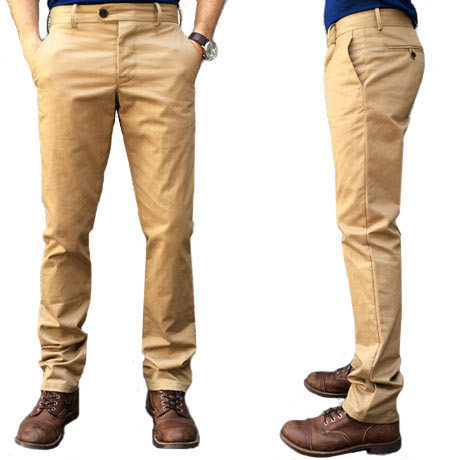 Gustin Chinos made from cotton blend twill woven right in the USA (North Carolina). This is the kind of fabric that sneaks up on you. That's exactly why we love it so much. On the surface, it's unassuming, but when you put it on, you just can't help but love it. At first glance, you might think this is the twill we launched our entire chino line with 3 years ago. In some ways you would be correct. It shares the same 3x1 construction, giving it a nicely defined twill line and a touch of ruggedness. It's a bit heavier at 8.5 ounces and it feels sturdy despite a very soft, natural feel. Yarn is where things become new. Just a small amount of lycra is woven in, but change in feel is big. When you move in all cotton pants, you reach point where you feel resistance. In these, you get just a bit of easing. It's quite nice and refreshingly comfortable. 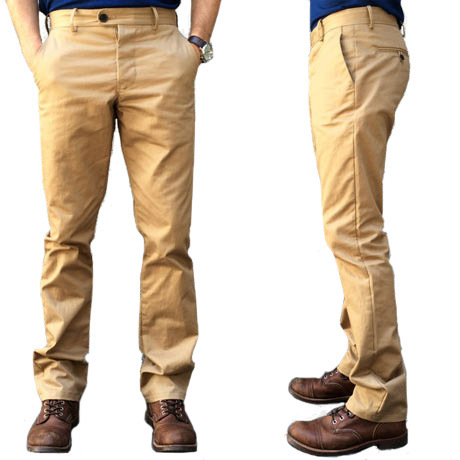 Whether you're sitting in the office, driving around or hiking, you will love the movement in these chinos. This style uses a rich graphite shade. It's dark and has just a touch of blue in it making a bit more interesting than a standard pure grey. These are simply must have chinos.